With all seven of the council's district seats up for grabs, incumbents Bruce Harrell, Rob Johnson and Sally Bagshaw already have bowed out. Lisa Herbold and Mike O'Brien are likely to run but have yet to announce. Seattle’s socialist City Council member, Kshama Sawant, will seek a third term. So will Debora Juarez, who in recent years has shepherded through the council deals to renovate KeyArena and to remake the downtown waterfront. Sawant launched her re-election bid Thursday, becoming the first incumbent to jump into the city’s pivotal 2019 elections. Her District 3 includes Capitol Hill, Montlake and the Central Area. “To make Seattle the kind of city that working people in our community need … we need more, not fewer, elected representatives like myself,” she said. Juarez will announce her candidacy Friday, she said in a phone interview. Her District 5 covers North Seattle. With all seven of the council’s district seats up for grabs, incumbents Bruce Harrell, Rob Johnson and Sally Bagshaw already have bowed out. Lisa Herbold and Mike O’Brien are likely to run but have yet to announce. Three District 3 challengers have registered campaigns: nonprofit executive Beto Yarce, pot-shop owner Logan Bowers and neighborhood activist Pat Murakami. There also are three challengers in District 5: environmental-policy consultant John Lombard, legal adviser Ann Sattler and provocateur Alex Tsimerman. 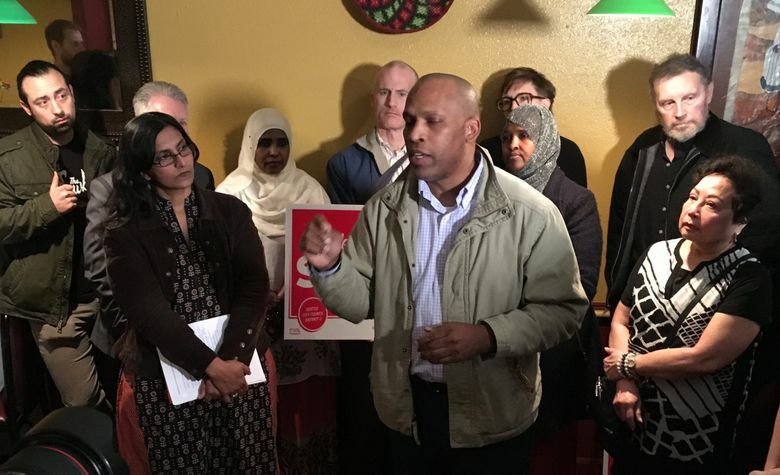 Speaking to reporters at Saba Ethiopian Cuisine, a Central Area restaurant threatened by redevelopment, Sawant described the 2019 elections as a struggle between wealth and people power. Business leaders will spend big to help one of her opponents this year, like they did in 2015, predicted the council member who garnered national attention when she initially won office as a socialist in 2013. “Who runs Seattle? Amazon and big business or the working people?” asked Sawant, who lost a battle last year for a per-employee tax on high-grossing companies to address homelessness. The Leschi homeowner is sometimes isolated by colleagues whom she regularly derides as corporate politicians and in recent years has seen her Socialist Alternative Party, which more or less runs her office, plagued by internal disagreements and overshadowed locally and nationally by the surging Democratic Socialists of America. When Yarce kicked off his campaign in November, he said Sawant had paid too little attention to nuts-and-bolts issues in her district. But union, immigrant, community and religious leaders who stood with the incumbent Thursday said they would seek to keep her uncompromising voice on the council. Sawant pushes her colleagues to the political left and no one else at City Hall, they said, so steadfastly supports people of modest means. They pointed to her success in efforts to establish a $15-per-hour minimum wage, declare an Indigenous Peoples Day in Seattle, cap move-in fees for renters and protect the Showbox music venue from demolition. Sawant won’t take part in Seattle’s groundbreaking democracy-vouchers program, she said. The taxpayer-funded vouchers, which the city will mail out in February and which are supposed to boost grass-roots participation in politics, allow residents to contribute $100 to candidates who qualify by agreeing to debates, spending limits and other rules. The council member said she must operate without spending constraints in order to compete with a business-backed opponent. Candidates who use vouchers can spend no more than $75,000 before the primary election and no more than $150,000 in total. Candidates can ask the city to surpass those caps in certain situations, when their opponents and outside groups spend more. But Sawant wants the freedom to raise and spend money steadily over the next several months without having to obtain permission, she said. She would struggle to catch up in time if her corporate adversaries dropped a large amount of money into the race at the last minute, her campaign said. Her 2015 race against challenger Pamela Banks was the most moneyed in council history. Sawant raised more than $480,000, mostly in small donations, while Banks raised nearly $390,000. Candidates who use vouchers can accept only contributions of no more than $250 per person, rather than the normal $500. Yarce, whose organization provides assistance to low-income entrepreneurs, submitted the paperwork required to qualify for the vouchers program Thursday, he said in a statement after Sawant’s announcement. To qualify, candidates must collect signatures and donations from at least 150 voters. Juarez said she decided to run again because she wants to continue working on various projects. “I’m very excited about the growth of the city and the growth of D5,” she said, referring to her district, where light rail will arrive in 2021 at Northgate.